Creating something always leaves a feeling of accomplishment. That is why Do-It-Yourself projects abound. It pays to be handy, as well. You need not wait for the professionals to get something done or repaired. But, there are projects that can prove to be above most layperson’s handyman abilities. Those projects include deck building especially for custom decks. O’Leary and Sons are the professionals you need to call for your Deck Designs Colorado Springs. The issues with your deck and the solutions may be some of the following. Instead of staggering joints at random, seam your deck, instead. The issue with staggering joints is that the ends of your wooden boards will split during fastening causing some long-term rotting because the splintered wood is untreated. Seaming is, then, more material efficient as boards will be at the exact length of what is needed. Because there will be no splintering, your deck would be more durable. It is faster to do, as well. How is it generally, done? Place a seam and, then, use boards of the same length of each section. Each seam should be made of a vertical decking board which is elevated with joists on both sides. All deck ends will have an inch and a half of framing. This also gives you the leverage to provide a fourth of an inch gap in between boards so they can fully dry out properly when the boards get wet. The vertical deck boards make decks look polished. The professionals always make a layout frame to take out the guesswork in the construction. This helps to properly, and accurately position the corner posts of the deck. Instead of using strings and batter boards to layout deck footings, use joints and deck boards. It is easier and faster to do it that way. A frame provides a solid guide to align post bases and place footing holes. A string on the other hand is flimsy. One can drive stakes to mark the location of your deck frame, and remove them when pouring footings or even to use them to dig holes for the footings. For the same reason why you need to put a gap between deck boards to allow proper drying of wet boards, it is essential that you construct your deck a little below your door (preferably around 3 inches below) so there will be a little gap below your doorsill to prevent rotting of your deck wood. The 3 inches is just enough for debris and leaves to fall through rather the gap rather than get stuck between the door and deck. 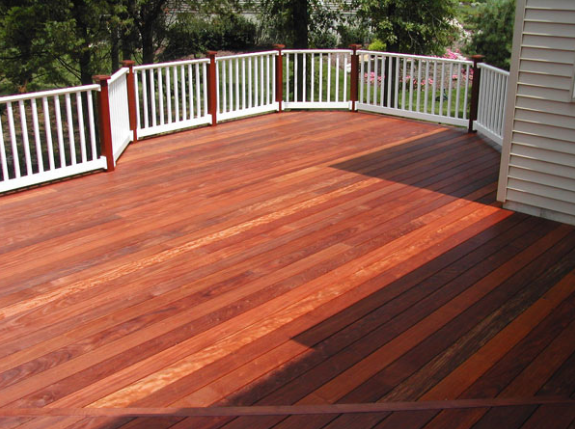 Call O’Leary and Sons Inc today to schedule your deck consultation.